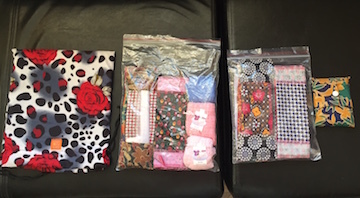 Little Sisters Fund | Summer Newsletter: So much great news! Summer Newsletter: So much great news! Over the past three months, we kicked off our fundraising campaign to launch our new Menstrual Health Management program, were honored for our commitment to girls’ education and empowerment, and attended the graduation of Kriti and Sapana from Shenandoah University—the first two Little Sisters to graduate from one of our partner universities in the United States. All while Usha enjoyed some time in the United States to visit with supporters and the U.S.-based graduated Little Sisters. The past three months have been packed with so much exciting news that we can’t fit it all in this newsletter. So, be sure to follow us on Facebook to keep up to date with LSF news and all of the successes of our current and graduated Little Sisters. We look forward to sharing even more great news in the second half of 2017! Our new series, Little Sister Spotlight, will tell the story of a new Little Sister who is in need of sponsorship. While we can only highlight four girls a year, there are many more girls just like Pooja who are awaiting sponsorship. For more information on how to sponsor a Little Sister, email Trevor at trevor@littlesistersfund.org. Meet Pooja. 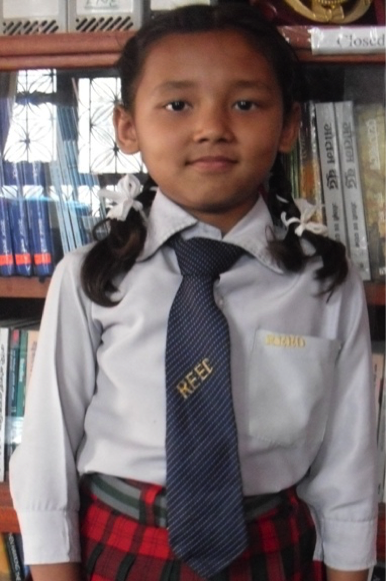 Pooja is in the 4th grade, loves to eat the Nepali food dal bhat (lentils and rice) and pomegranates, and loves going to school. But, just last year, she was at risk of being taken out of school by her parents, who have no regular income and could no longer afford to pay tuition fees. Luckily, Pooja’s parents had heard about Little Sisters Fund, and she was accepted into our scholarship program this year. Pooja didn’t even have to miss one day of school. Now, she can continue to deepen her love of Math and can one day become the doctor she has always dreamed of becoming. While Pooja has been accepted to our program, she still needs a sponsor. If you or someone you know wants to sponsor Pooja, or another girl like her, please let us know! By now, many of you have heard that we are launching a new Menstrual Health Management program this year. We have been fundraising hard these past few months and, thanks to supporters like you, we are close to reaching our goal! Why do we need this new program? In many communities in Nepal, menstruation is a taboo subject. One that keeps girls out of school while they menstruate, forbids girls from entering the kitchen and touching others’ dishes or utensils, and even banishes some girls to sheds behind their homes. This can translate to up to two months of missed school a year for some girls. Through menstrual health education and the provision of basic, reusable feminine hygiene products, we can break the taboo, empower girls with knowledge, and keep them in school. While cheering on Kriti and Sapana at their graduation from Shenandoah University, Trevor and Usha were surprised with an accolade of their own. SU President Tracy Fitzsimmons awarded them the President’s Medal for their outstanding commitment to female safety, education, and empowerment over the past 19 years. We were very honored to have been granted this award for our work. The COMO Foundation’s annual magazine, COMO Stories, features a great article about Little Sisters Fund’s Community Projects program. We started this program after the 2015 earthquakes to help rebuild many communities in Nepal while also providing the Little Sisters with an opportunity to gain valuable leadership skills by identifying, planning, and implementing small scale development projects in their communities. To date we have implemented a dozen projects in nine districts. We couldn’t do this work without the support of the COMO Foundation and for that we are very grateful. Remember that Amazon Smile is an easy way to give to Little Sisters Fund! Shopping at Amazon Smile is exactly the same as shopping at Amazon. It has the same selection, same prices, same shipping . . . same everything. Except, every time you shop on Amazon Smile, half of 1% of your purchase amount is automatically donated to us when you select Little Sisters Fund as your charity of choice. It doesn’t seem like much, but it adds up! 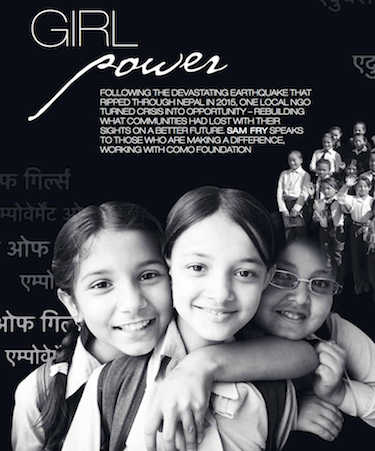 Click here to support girls’ education in Nepal while you shop and bookmark this page so you can find it easily the next time you need to do some online shopping!